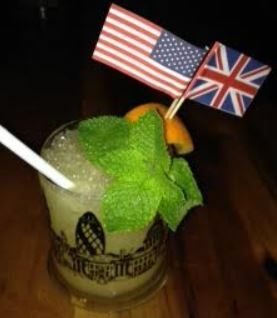 It was perhaps a little different for me as a Canadian to go to a Polynesian-themed restaurant in the United Kingdom to have a dinner celebrating the US Independence Day. The dinner itself was absolutely gorgeous with deep flavours and an interesting dessert. The menu is sort-of fixed. That is, there are three choices for each course and each one will be an agony to choose. I opted for double ribs and a dobos torte. We were offered a very interesting choice of white or red with a high acidity on the white perhaps to compliment the fish or vegetarian menu selections and a red which would be best with the ribs I had chosen. 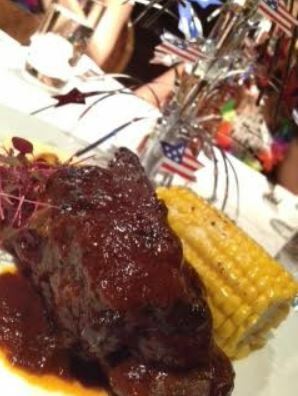 The starter of ribs I had were amazing. In fact, I would have been happy with them for starter, main *and* dessert. The original 1972 recipe is absolutely perfect and despite being only two years younger it is as perfect now as it probably was then. These are normally £10 and absolutely worth every penny. I could live on nothing but these forever. In fact, I regret trying them as I will never be able to go for long without them – I’ll be back to Trader Vic’s for these alone. I then went on to the Mongolian Short Beef Rib. It was quite fatty giving the meat a great tenderness though it also made it a bit filling. Frankly, I wanted more of the 1972 ribs 😉 The roasted bell pepper mash and corn were OK but I think as a Canadian who has had corn that was picked mere hours earlier I’ll never feel corn elsewhere is ever as good 😉 This was very filling and I knew we still had dobos torte to come. 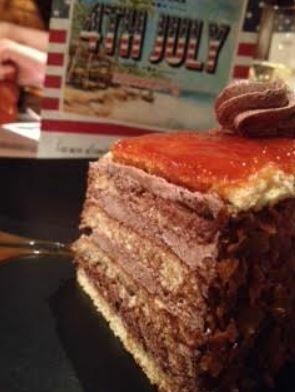 The solid dobos went for slightly thicker layers than I had been exposed to before and was quite solid and a touch try. 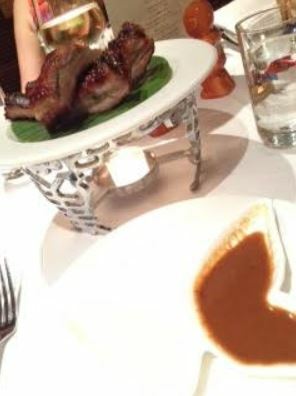 They had gone for a crunchy caramel top and a burnt caramel sauce which was devoured by some of the bloggers at our table. 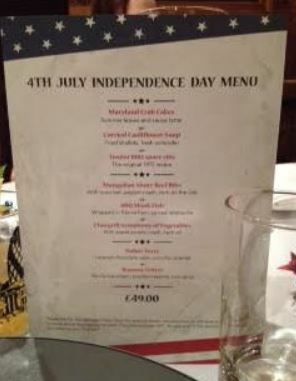 All in all it was a delightful 4th of July menu and available TODAY ONLY for £49 for all three courses so pop along to Trader Vic’s in London for an experience you’ll love.